Parents these days know to monitor what their kids watch on TV -- very effective, as kids are loathe to defy 6ft-long lizards who don't want them watching Skinemax. For designs from a dude whose 'rents thankfully didn't know about reptile-assisted discipline, check out the Art of Elstabo. 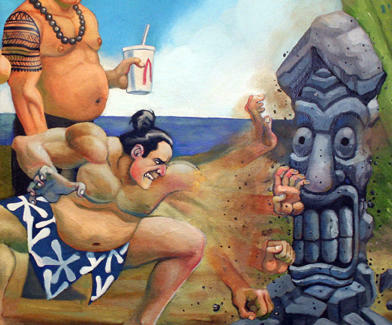 Based in Northern VA, Elstabo dreams up wild acrylics & oils inspired by cartoons and comic book characters, subject matter he asserts is the result of a childhood spent "growing up with a remote control at his disposal", which was actually quite common, as Ken Ober will do anything for money. Awesome notables include: Baroness A tribute to one of the artist's favorites (and G.I. 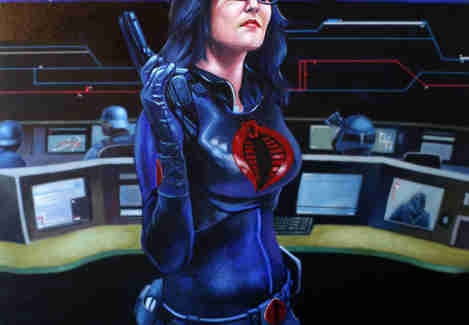 Joe's hottest), the tight black leather-clad lady-villain holds a pistol in front of the control room for Cobra, a bustling station where everyone's wound too tight...until they are released for awesome 360-degree punching action! 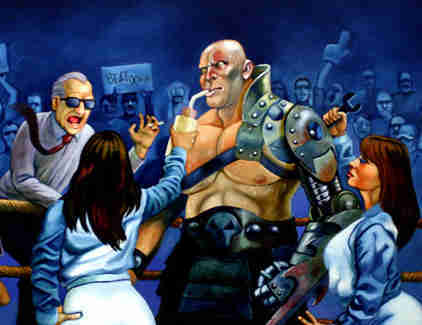 Challenger A muscular cyborg gladiator is given ring instructions by a bald cornerman while a curvaceous ring girl attends to his giant knife arm, which all but ensures a split decision. 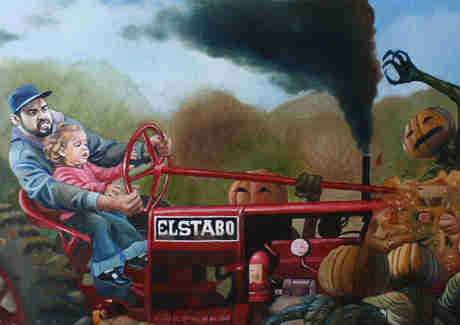 Pumpkin Pie This 22''x28'' piece sees the artist and his daughter on a tractor, barreling through a horde of evil creatures inspired by the baddie from Pumpkinhead, which incidentally, feels way better than a jack o' lantern. And for works seemingly inspired by later night shows, Elstabo's also got a section of "erotica" pieces that range from legit artsy, to designs so hot, not responding means you're the one who's cold-blooded.